It was a hot afternoon—the kind that doesn’t belong in September, but, because it’s Texas, a few always manage to creep their way in. But, like all afternoons since 1968, there sat the monstrous, two-mile race track that once hosted the highest levels of American auto racing. Only this time, things were different. Almost immediately after Hurricane Harvey hit the state’s coast, Texas World Speedway in College Station became a giant holding ground for flooded cars headed to insurance auction after the storm. Flood storage took precedence over the racing events, and all were canceled once the flatbed trucks began rolling in. 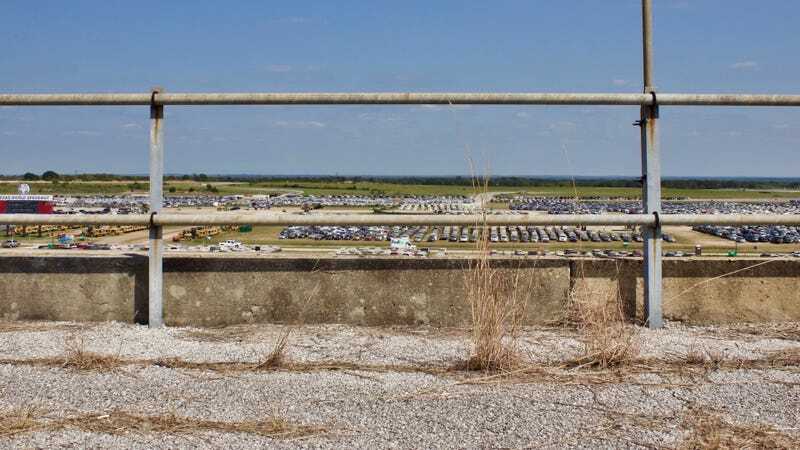 The troubled Texas World Speedway held its first sanctioned race in 1969 and hosted the likes of NASCAR and IndyCar, but things never caught on like they did at its sister track in Michigan, which had an almost identical layout. The track’s small hometown, College Station, had an equally small highway leading into it, and the infield was never paved for race haulers to unload on. Inconveniences such as those led in part to the low attendance figures that the track never could salvage. Texas World had half the crowd numbers that sister track Michigan International Speedway did for the same racing series, and by the 1980s, all of the major national touring series had trimmed the speedway from their annual circuits. NASCAR was the last to do so in 1981. The ground under the oval’s high-banked turns eventually deteriorated, making only the interior road courses fit for racing. The speedway stayed around to host amateur racers longer than it was supposed to, as its landowner planned to send in bulldozers to make it into a subdivision more than two years ago. But the storm was what finally did it. A former Texas World employee said at the start of September that all motorsport operations and events at the track were ceased, and that it was “no more.” He said he found out about it, and the end of his employment, via email. My mother talks fondly about seeing A.J. Foyt and Darrell Waltrip race out at Texas World when it was still on the radar of the country’s biggest touring series. Being born in 1995 and not interested in cars until my teen years, I came to love Texas World in its current state—neglected, defunct and so deeply in disrepair that it would take millions to climb out of. Empty, or scarcely populated, is the only way I’ve seen the speedway since a non-motorsport summer festival came there in 2007. A huge fire broke out in the non-paved, grassy parking area, destroying rows of cars and barely missing our 2004 Toyota 4Runner. The festival didn’t come back the next year. But empty, mesmerizingly historical and defunct is all I’ve known the track to be. Pulling into it for what was probably the last time, that wasn’t how it felt. Now it’s turned into an operation. Huge flatbeds went in and out of the speedway in groups of three, four and five, carrying cars that looked fine on the outside but were mechanically totaled on the inside. A police officer was at the front of the often empty road leading into the track, stopping every car that wasn’t branded or a flatbed from coming in. The infield that I so often waltzed into, sometimes for a particular reason and sometimes just to see it, was off limits. It was a “live operation,” I was told. It was a live dumping ground. The tucked-away entrance to Texas World—a grassy hill behind which the grandstands sit. I was allowed on top of the grandstands, a place I’d never been before. There were flooded cars everywhere—thousands of them, with flatbed upon flatbed hauling more in to dump before turning around to start the cycle over again. The scene was eerily active. It looked, to me, like the NASCAR race I never got to see there—a packed infield, full of cars, ready to watch the races at one of the largest oval tracks in the country. But the cars in the infield were just as dead as the track itself. No one was here to do anything other than their job: dumping them off. I left the speedway for one last time, creeping down from the heights at the top of the rusted, now brown grandstands, seeing the sweeping, almost artistic banking heading into the track’s first turn. Tar snakes had mended the track’s surface together over the years, until the ground underneath simply gave up. Tar snakes, rusted grandstands and all, the track was still a thing of beauty—as it always has been. It’s a huge, eery reminder of what happens when the big bucks pass something by, and at the same time, it made itself a place in the hearts of both the people alive to see its better days and those who weren’t. And if it was my last time to leave that beautiful facility, well, I think I’m out of words to say—like I often was when standing in its infield, staring at what could have been.